When: Mon., April 22, 10 p.m.
DJ Q-Bert has been spinnin' wax since the '90s and is considered to be the best record-scratchers around. 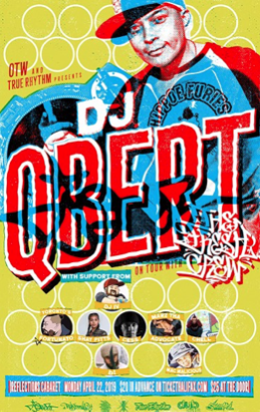 The San Francisco Chronicle lays out how he's influenced your favourite rappers and beat makers, offering: "Qbert had earned a reputation for putting the jockey into 'disc jockey,' manipulating records in a rhythmic way that spun a path for talented DJs to finally be seen as musicians. With a scratching style that was more percussive than, say, the average rock drummer." Get an earful of hip hop history as he shares the stage with some of the city's best DJs and MCs.